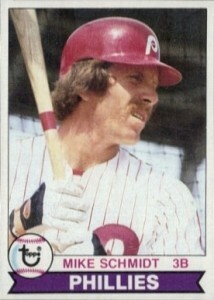 The 1979 Topps Baseball checklist has 726 standard-sized cards measuring 2 1/2 by 3 1/2 inches. The key in the set is the Ozzie Smith rookie card (#116). Pictured as a member of the the Padres, it's almost uncomfortable seeing the eventual Hall of Famer in a uniform other than the Cardinals. 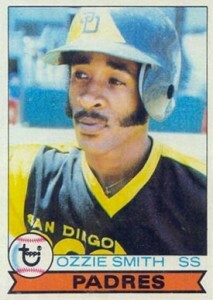 Unfortunately, after Smith, the level of quality rookie cards drops off dramatically. 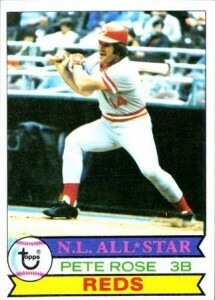 Others included in the 1979 Topps Baseball card set include Carney Lansford (#212), Pedro Guerrero (#719) and Rick Honeycutt (#612). The majority of these players are found on multi-player cards on higher number cards later in the set. In the past, these rookies were assembled based on position. 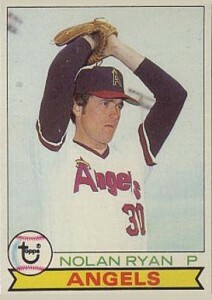 However, for 1979 Topps Baseball, the company decided to utilize a theme based on prospects by team. Instead of the rookies, it's veterans like Nolan Ryan (#115), Pete Rose (#650) and Mike Schmidt (#610) that command more overall collector interest and attention. Several stars from the past are featured on the All-Time Record Holders subset that runs from card numbers 411 to 418. Ty Cobb, Walter Johnson and Roger Maris are some of the featured players. 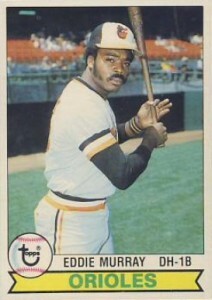 Another notable card is that of Bump Wills (#369). When the set first came out, he was shown in a Rangers uniform but named as a member of the Toronto Blue Jays. Topps did issue a corrected version of the card. However, neither card commands any sort of premium. 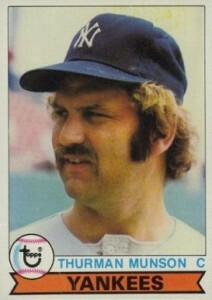 Also of note is that 1979 would be the last regular-issue card of Yankees catcher, Thurman Munson, who died tragically in an airplane crash. 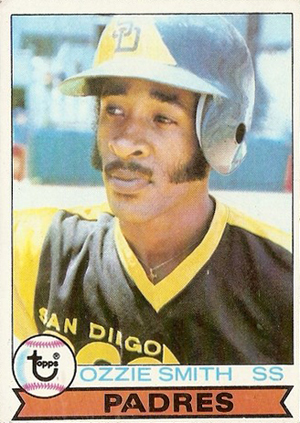 Much like the 1978 Topps Baseball design, card fronts have a simple look to them. 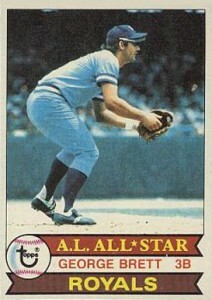 A large player photo dominates the landscape on the front of the card. Just underneath the bottom edge of the player photograph is their name. Below that, a color banner includes the team nickname A Topps logo inside a baseball inset on the bottom left hand corner rounds out the design elements. Players who had been selected for the All-Star team have an additional and contrasting color banner placed above their name designating as a specific league All-Star. The card backs of the 1979 Topps Baseball card set contain the customary biographical and statistical information including, when room is available, a brief piece of player trivia. A baseball themed trivia game called Baseball Dates is also incorporated onto the card backs. 1979 Topps Baseball cards were sold in the following formats; wax packs, cello packs and rack packs. Printed as an entire, single series, 66 of the cards were double printed to fill the printing sheets. The most common condition issue for the set is centering. Many of the cards in the set are absolute plagued by this condition. This translates into a significant premium, considering their era, for cards receiving high-grades. In 1979 Topps issued a test offering consisting of 33 wax wrapper comics measuring 3" by 3¼". As with many Topps issues, at the time, they weren't very popular with collectors. Years later, there has been a renewed appreciation for the tiny comic wax canvases. Included in the set are many stars from the day, such as, Nolan Ryan (#4), George Brett (#9), Eddie Murray (#1), Jim Rice (#2) and Carl Yastrzemski (#3) to name a few. Use it all the time to find information on vintage as well as new cards.